Immediate, 24/7 emergency service for all your plumbing, heating, & air conditioning needs. Receive $300.00 off installation of new heating or AC system with this coupon. Receive $50.00 off any water heater replacement with this coupon. With over 25 years of experience providing high-quality home services, Rich’s Plumbing, Heating, & Air Conditioning has built a solid reputation as New Jersey’s leading source of plumbing, heating, and air conditioning repairs and installations. We’ve earned this reputation through our commitment to complete customer satisfaction in every job we perform. 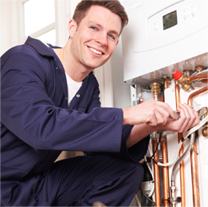 We offer fast, 24/7 emergency service for residential plumbing, air conditioners, furnaces, water heaters, and more! Our friendly, licensed technicians are always available to take your call and our trucks are fully equipped to provide an immediate response for any situation. Count on Rich's to assist with inspection, maintenance and repair issues for your home furnace and air conditioning systems. Our certified technicians are on call and ready to respond 24/7 for all of your winter home related issues.